It has been a mystery, how galaxies so faint – containing up to 1000 times fewer stars than the Milky Way could still be just as large. Over the last year, researchers have observed some very faint, diffuse galaxies. The galaxies are as faint as dwarf galaxies, but are distributed over an area just as large as the Milky Way. Now new research from the Niels Bohr Institute shows that if a lot of supernovae explode during the star formation process, it can result in both the stars and the dark matter being pushed outwards, causing the galaxy to expand. The results are published in the scientific journal, Monthly Notices of the Royal Astronomical Society, Oxford University Press. Galaxies are gigantic collections of stars, gas and so-called dark matter. The smallest galaxies contain a few million stars, while the largest may contain several hundred billion stars. The first stars already emerged in the very early universe about 200 million years after the Big Bang, formed from the gases hydrogen and helium. These giant clouds of gas and dust contract and eventually the gas is so compact that that the pressure heats up the material, creating glowing balls of gas and new stars are born. The stars are collected into galaxies, the first of which were baby galaxies of a sort. The theory of the astronomers is that the baby galaxies gradually grew larger and more massive by constantly forming new stars and by colliding with neighbouring galaxies to form new, larger galaxies. The largest galaxies in our current universe have thus been under constant formation throughout the history of the universe. Earth and our solar system are located in a large galaxy, the Milky Way. The ultra-diffuse faint galaxy, Dragonfly 17 is shown next to two other galaxies for comparison. The large spiral galaxy, the Andromeda galaxy is shown on the left and the elliptical dwarf galaxy, NGC 205 is shown higher up in the image, while the diffuse ultra-faint dwarf galaxy, Dragonfly 17 can be seen to the right. (Credit: Schoening/Harvey/van Dokkum/Hubble Space Telescope). 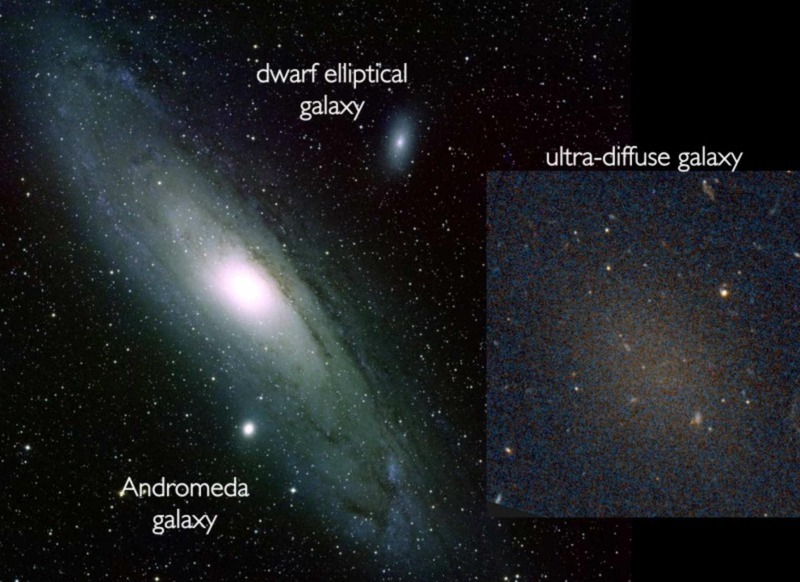 But the newly discovered, ultra-diffuse faint galaxies were difficult to classify and while some researchers thought that diffuse galaxies were just large spiral galaxies with a large amount of dark matter, others thought that it was a case of ordinary dwarf galaxies. But a research project led by a researcher from the Niels Bohr Institute at the University of Copenhagen has been able to recreate the characteristics of the galaxies that have been observed by using advanced computer simulations, performed in collaboration with the New York University Abu Dhabi. "By recreating almost 100 virtual galaxies, we have shown that when there are a lot of supernovae during the star formation process, it can result in the stars and the dark matter in the galaxy to be pushed outwards, causing the extent of the galaxy to expand. When there is a small number of stars in an expanded area, it means that the galaxy becomes faint and diffuse and is therefore difficult to observe with telescopes," explains Arianna Di Cintio, PhD in astrophysics, Dark Cosmology Centre at the Niels Bohr Institute at the University of Copenhagen, who is the leading researcher of the project. She explains that the mechanism that causes the stars to move away from the centre is the same one that is able to create areas with a lower density of dark matter. The many supernovae are so powerful that they blow the gas outwards in the galaxy. As a result both the dark matter and the stars move outwards so that the extent of the galaxy expands. The fact that the galaxy is spread over a larger area means that it becomes more diffuse and unclear. "If we can recreate ultra-diffuse galaxies with computer simulations, it proves that we are on track with our cosmological model. We therefore predict that there are ultra-diffuse galaxies everywhere – not only in galaxy clusters. They are dominated by dark matter and only a small percentage of their content is comprised of gas and stars and the most important thing is that they are dwarf galaxies with a mass of only about 10 to 60 times less than a large spiral galaxy, which is to say significantly smaller than a large galaxy like the Milky Way," says Arianna Di Cintio. In addition, the researchers expect that among the more isolated located ultra-diffuse galaxies, the largest could contain more gas. They are therefore initiating close collaborations with research groups carrying out observations of very distant areas of the sky with powerful telescopes in order to confirm these theories. "It will open a whole new window into galaxy formation – there may be thousands of ultra-faint galaxies that are just waiting to be discovered," says Arianna Di Cintio, who is looking forward to finding out their amount of stars, their content of elements and how the ultra-diffuse galaxies survive in galaxy clusters. Andromeda Galaxy's Past "Much More Violent than Our Milky Way"
New Milky Way Neighbor Discovered –"May Be a Huge Number of Dwarf Galaxies Out There"